With a terrific cast and a unique perspective on the story, Victor Frankenstein had so much potential. Sadly, it simply falls flat. There have been many retellings of Mary Shelley's Frankenstein. There was the classic 1931 version, starring Boris Karloff, the more entertaining spoof Young Frankenstein, starring Gene Wilder and so many other movies in between. The latest twist, Victor Frankenstein, reimagines the story from the perspective of the mad scientist's assistant, Igor. Twentieth Century Fox Home Entertainment has released the movie on Blu-ray and Digital HD this week for those eager to purchase it. "Igor" (Daniel Radcliffe; all of the Harry Potter films) was a circus freak with above average intelligence and an interest in the human body. When a freak accident brings him to the attention of medical student Victor Frankenstein (James McAvoy; X-Men: Days of Future Past), Frankenstein helps him escape his captors, and fixes his hunchback. In return, Igor helps Victor with his latest experiment which, while seems innocent, ultimately is much more dangerous than Igor first realized. With a terrific cast and a unique perspective on the story, Victor Frankenstein had so much potential. Sadly, it simply falls flat. At first, I was intrigued and interested to see what was coming next and the first 30 to 40 minutes held my attention. Unfortunately, after that point, it just got boring. Watching Igor and Victor bring (spoiler alert) the animal to life was fascinating, but by the time they got to the human monster towards the end, I just didn't care anymore. 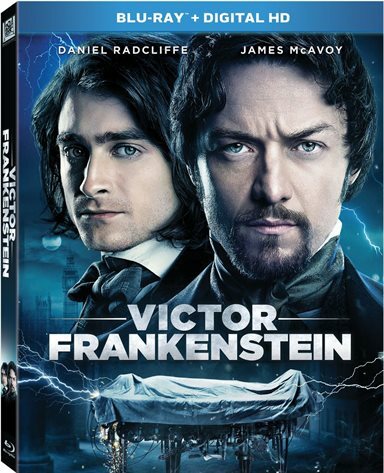 McAvoy and Radcliffe are excellent, and I really believed McAvoy as the passionate yet eccentric Frankenstein. Supporting cast members Jessica Brown Findlay (Downton Abbey) and Andrew Scott (Spectre) are also terrific, but, sadly, can't help this doomed script. Director Paul McGuigan (Push) also does a fine job, but, on numerous occasions, I felt as if I was watching a Guy Ritchie Directed feature, a la Sherlock Holmes. Many of McGuigan's camera techniques, angles and "drawings" were extremely similar, and if I hadn't already known it wasn't Ritchie directing, I would have sworn it was. Ritchie should be flattered, as it's a nice homage to his style, but I didn't find much that was different to stand out at uniquely McGuigan. The minimal Blu-ray extras were equally as boring as the movie itself. Almost 15 minutes of deleted scenes and a 30 minute look at "The Making Of" were all that were offered and halfway through the second feature, I no longer cared. Even with the fascinating subject and great actors, the extras couldn't hold my interest, which is a shame, and continued the lackluster tone of the whole experience for me. The 1080p High Definition video and DTS-HD Master Audio 7.1 are two of the saving graces of the Blu-ray. The video quality is superb with sharp, crystal clear pictures and the audio is crisp and tight and showcases every thunderclap. The picture quality also enhances the wonderful costume and makeup design, which is a plus for the overall film. If it wasn't for the cast, I would have easily rated this film a D at best. However, even with the superior actors and somewhat original plot, there just wasn't enough behind them to make this movie a worthwhile purchase. See it once for the novelty, but unless you are a Frankenstein "geek", don't bother owning it. Download Victor Frankenstein from the iTunes Store in Digial HD. For more information about Victor Frankenstein visit the FlickDirect Movie Database.